Member British Audiological Association, UK. 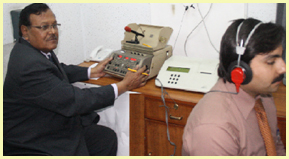 Pure tone audiometry being carried out . 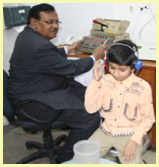 Play audiometry being carried out on a child. Distraction test being carried out on a very small child. If a family member has a hearing problem. You can only imagine how a hearing impaired person would feel. Try blocking both your ears with a ball of cotton for one day. You will quickly realize how a hearing impaired person is cut off from his/her surroundings. To help the hearing impaired in the family as much as possible, follow the simple tips given below but remember to get their hearing test done as soon as possible and get them back to the world of sounds. When talking to them, always face the hearing impaired person with a clear eye contact. Some people can lip read and will be further disadvantaged if you turn your face away or put a hand over it. Words have different frequencies and intensities so be prepared to use alternate words if the person finds it difficult to understand your sentence. Do not speak too fast and try to use short sentences to give them time to understand. If possible, the ambient noise should be kept low in the place where the conversation is being carried out. Turn down the volume of the TV or move to a quieter room for their convenience. Remember! Be Patient with them! You cannot hear the other person at a distance of 3 feet. Or simply, you have to use a loud voice to be heard. To give you an idea of how loud a sound you are hearing is, we have tabulated various sound pressure levels below. The unit used for sound pressure level is called decibel (dB). A very soft, barely audible sound a person with normal hearing can hear. Normal conversation / noise of a ceiling fan at moderate speed. So, the damaging noise is all around us generated by airplanes, traffic, machinery and even recreational activities such as rifle shooting, personal (MP3) players and concert speakers. Repeated noise above 85db or one exposure to a sound of 140db can damage the hearing. In the UK, employers are required to provide hearing protection to their employees if the noise level in the workplace is on a weekly or on average at 85dB. Does noise affect the health of a person exposed to it? Sleep problems such as insomnia. Performance problems at work and school. Even the development of an unborn baby can be affected by noise. Which are the common sources of noise which I should avoid? Gun shooting and hunting is common which is a important source of noise and the ears should be protected while hunting. The domestic lawn mowers which are powered by a strong electric motor are also a source while sitting next to a large concert speaker can be permanently damaging to the hearing. Industrial workers and professional builders with heavy electric machines such as used by carpenters can be damaging to the ears of the workers themselves as well as the people near the machines. Are there any things available which can protect my hearing? Yes there are several forms of ear protection such as ear plugs, ear moulds and headphones are available on the market ( as shown below). These ear moulds can be custom made as well which give an excellent fit against noise and water contamination. What are the types of hearing aids available on the market? There are basically three types of hearing aids available on the market. One sits at the back of the ear and is called the “behind the ear” hearing aid, followed by one which sits in the hollow of the ear which is known as the “in the ear” hearing aid and finally there is the “in the canal” hearing aid. Your audiologist is the best judge of the type of hearing aid you should use especially when your hearing is quite poor. Tinnitus is not a very uncommon problem. Characteristics of the noises which are expressed as tinnitus are variously described by patients. It is described as ringing, roaring, swishing, whistling or a clicking noise. It is also compared to a cricket making a noise in the background. Tinnitus can be in one or both heads or in the head. It is present intermittently in some and constantly in others. It is regarded as a symptom rather than a specific disease. Sometimes a cause is clearly seen while at other times it is not easy to detect this is because the tinnitus is usually a problem of the perception of sound. A person has what is known as ‘subjective’ tinnitus if only the patient can hear the ‘noises’. External and middle ear problems such as ear wax, middle ear infections can cause tinnitus. Otosclerosis where the third middle ear bone is fixed and not able to move with sound waves also can cause tinnitus. Similarly, any problems in the inner ear with damage to the delicate hearing mechanism of the cochlea (hearing organ) will result in tinnitus. Certain occupations where people work in noisy environments can damage their hearing mechanism as well. Hunters and military personnel who use rifles but do not wear ear protection while shooting are liable to hearing loss. Sitting next to a large speaker in a musical concert is a source of danger as well which might, initially, cause a ‘temporary threshold shift’ which might progress to a permanent hearing loss with hair cell damage. The hearing nerve damage by other mechanisms can result in tinnitus as well. Any tumours on the hearing nerve or medicines such as aspirin or the cancer drugs can result in a nagging tinnitus. Normal wear and tear during the aging process causes tinnitus as well and at times wearing a hearing aid might help reduce or eliminate the tinnitus. Certain medical problems such as of the thyroid gland or a high blood pressure also cause tinnitus. Stress is a contributory factor as well. The tinnitus rehabilitation therapy is thought to be useful. Use of hearing aids to amplify the environmental sounds is helpful as it ‘masks’ the tinnitus noise. But using hearing aids are useful if the there is a hearing loss. Use of anti anxiety tablets help at times with patients who have stress as a cause of tinnitus. Psychiatric assessment and counseling is helpful too in certain cases. There are a number of alternative treatments recommended but their usefulness is still to be proven. Control your salt, coffee, cola and smoking. It is important that you don’t worry about your tinnitus. It is nagging and an nuisance but it will not harm you physically. So, learn to ignore the sounds. Competing sounds such as keeping the radio or the TV switched on at a low volume all day will help, especially when it is not tuned at any particular channel. Some people find it difficult to get down to sleep as the silence makes the tinnitus worse. They find it helpful to keep the radio on using the ‘snooze’ button which switches the radio off itself after a fixed time which gives you time to settle in and get to sleep. Tinnitus maskers are useful as well and have to be fitted by an audiologist. Fellow of The American College of Surgeons, USA. Fellow of The Royal Society of Medicine.